Leslie Fambrini is on Wendy’s WOW List of Trusted Travel Experts for her expertise and connections as regards luxury cruises. The reviews below are from real travelers who’ve taken trips that were arranged by Leslie and monitored by Wendy. Don’t miss Leslie’s Insider’s Guide to European Luxury Cruises. We once again selected Leslie Fambrini from The WOW List for her expertise in European luxury cruises. Leslie previously arranged a wonderful Sea Dream Yacht Club cruise through the Adriatic with additional weeks on land in Dubrovnik and Venice for us a summer ago. We were so impressed with Leslie’s expertise, listening skills, and attention to detail that we again selected her for this past summer’s month-long vacation. We selected Sea Dream Yacht Club again for an 11-day cruise through the Med. Although we did not give Leslie as much lead time for this trip, she was able to magically secure us a wonderful stateroom on our desired deck. Pre and post cruise, her hotel recommendations were superb. We started our journey with four days in Nice at the Hyatt Regency Nice Palais de la Méditerranée on the Promenade. A wonderful hotel in a great location. Upon debarkation in Barcelona, we stayed a week at the beautiful Mandarin Oriental on the Passeig de Gracia. We ended our trip with a week at the fabulous Waldorf Astoria Amsterdam directly overlooking the Herengracht canal. Leslie ensured we had outstanding rooms in the finest hotels in the best locations. She also arranged all hotel cars and drivers so there was no need trying to taxi in unfamiliar places. Once again, Leslie guided us to another fantastic adventure – we couldn’t have done it without her. A true WOW List expert! This couple’s WOW Moment landed them in Bora Bora. My husband and I wanted to take a cruise after the holidays. We are veteran cruisers and could have just booked through a cruise website directly, but we had a few questions we felt a travel agent could help us with related to which line/ship/itinerary and geographic location at the time of year we planned to travel (over New Years). Because of great experience with other WOW List Travel agents in the past, I started there. But I could not tell from the online descriptions who might be the best fit. So I emailed Wendy directly (!) – and got 2 names of cruise specialists who could meet my needs, with Leslie having a slight edge, based on our specific needs. I had a great first call with Leslie within hours of connecting by email. She guided us through options by asking the right kind of questions and we ultimately settled on a 7-day cruise on the Paul Gaugin with a day on either end in Tahiti. From there it was pretty seamless to complete the rest of the air and land arrangements with her (with our preferred airlines, etc). We sometimes questioned Leslie’s recs, but are glad we ultimately followed them as they were always right on target. We particularly appreciated the advice to splurge on the over-the-water bungalow on the day of arrival at the Intercontinental Papeete. I’d been skeptical that our room would truly be available at 7:00 am when we arrived at the hotel and that we’d end up in “day room purgatory”. But it was fantastic! we checked in before 8 am and had a wonderful pre-cruise stay in our own little luxury hut. The Paul Gaugin exceeded expectations in that the mix of other guests was so varied by age and country of origin including multi-generational family gatherings, honeymooners, mid-life romances, a few kids. It was a very international (not US) group and a fairly substantial minority of guests were Polynesian—amplifying the authenticity of the onboard cultural activities. When the Polynesian guests wore leis to dinner and sang along—harmonizing with the “entertainment”, you felt that you weren’t watching a show made up for tourists, but more like being a guest at a family celebration. Then there was the whole WOW Moment (or WOW DAY-Night-Morning!- that’s a whole other review! )….I will never know how much WOW was Leslie and how much was Wendy, but this was one of the most magical days/evenings of our lifetime travel experience. Thanks! Leslie went above and beyond to ensure that our cruise was perfect! She was incredibly knowledgeable about Silver Seas and forthright about the positives and the few negatives we might encounter. She was charming and personable, yet always professional, in our communications while planning the trip as well as after our return. Well most definitely use Leslie on our next cruise! Leslie Fambrini and Wendy Perrin’s The WOW List recently supported my husband and me in planning and executing a three week trip to the Adriatic from June 23 to July 14, 2017. We spent seven nights at the Villa Dubrovnik in Dubrovnik, Croatia. We then embarked on a seven-night cruise up the Dalmatian coast on the Sea Dream. We ended our trip with a six-night stay at the Ca Sagredo in Venice. It was a perfect trip thanks to Leslie. We initially selected Leslie from The WOW List for her expertise in European luxury cruises. I’ve been an avid reader of all things Wendy Perrin for many years and her selected travel specialist list has always been great fun to read. Leslie listened to our ideas about what makes a trip special for us and we decided Sea Dream Yacht Club would be perfect for us. We asked her to help us expand our cruise to a three-week vacation and after a lot of discussion with us, she suggested the above hotels. Sea Dream turned out to be the perfect ship for us. It is a small, beautiful ship with a high-quality staff and Leslie reserved the perfect cabin for us. We felt like we were on a private yacht. Leslie also got us a very nice credit in the ships lovely spa. The hotels could not have been better for us. They were amazingly beautiful. They were perfectly located and their staffs were outstanding. Our rooms were magnificent with unbelievable views — essential for us. Leslie got us the rooms at a fantastic price with included upgrades. We could not have done this on our own. Leslie provided us with a very comprehensive travel packet before our trip began. It included precise information on all details of our travel including names and numbers for local contacts. It was invaluable. Leslie took a lot of worry out of our trip by arranging all of our taxies, and boat, transfers between airports, hotels, and our ship. In all cases, it was VIP quality transportation. These arrangements were booked directly to our accommodations so there was no need to procure our own services or negotiate prices in foreign currencies. We did not ask Leslie to arrange any special restaurant experiences or local tours during our trip as we usually prefer to roam on our own. Fortunately, we did not need any emergency assistance or other support during our trip. Based on our stateside experience with Leslie, we felt confident we could contact her from overseas if necessary. We love Leslie. She really listened to us. She knows her business. As a result, we had a fantastic adventure! Thank you, Leslie and The WOW List. My husband and I were cruise newbies. All we knew was where we wanted to go and that we wanted to do it by ship. Leslie helped us pick the cruise line, the ship, and the location of our room—-all of which were just right for us. She also found us our own guide and driver for St. Petersburg, saw to it that we got tickets to see Swan Lake at the Mariinsky Theater, and made suggestions for what to do in other cities. And she recommended hotels for the beginning and end of the cruise that were just right for us. Leslie Fambrini handled the cruise booking with Seabourn in its entirety, as well as a few of the hotel accommodations and a shore excursion. At all times, Leslie and her staff were knowledgeable, competent, responsive and accommodating. Leslie was in a position to help us take advantage of a last-minute upgrade on the ship (Quest) and in obtaining onboard credits. 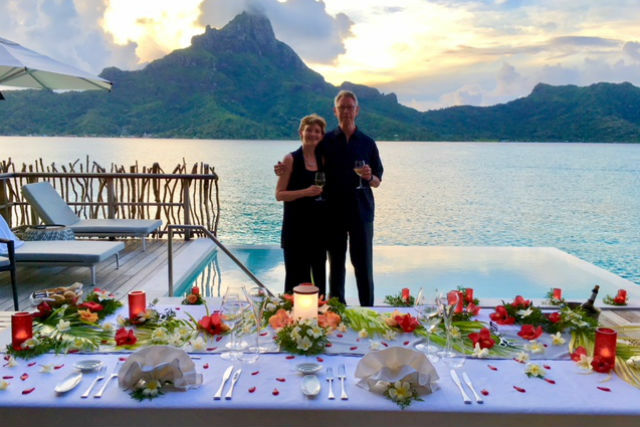 Because of her association with Virtuoso Travel, Leslie was also able to secure advantages at hotels, including potential upgrades, check-in and check-out flexibility and food & beverage credits. Leslie’s Personalized Travel Consultancy operation served us very well, and we highly recommend her as a WOW List member.